My blogging guru, Tris Hussey, warns that a blog’s first post is always terrible. Nevertheless, I can’t resist devoting this post to the most interesting tidbit I know about the history of Spanish: the relationship between piracy during the Spanish colonial period and today’s Latin American dialect patterns. The following is based on Ralph Penny‘s discussion of the topic in his Variation and Change in Spanish (Cambridge University Press, 2000). Essentially, piracy in the Atlantic was so rampant during the colonial period that the Spanish government was forced to restrict naval traffic between Spain and the New World. Twice a year, officially-sanctioned, well-armed flotillas set sail from southern Spain to the Caribbean via the Canary Islands. 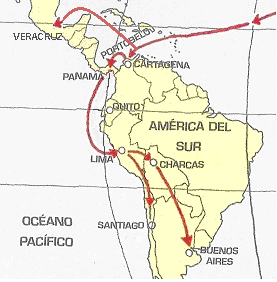 As shown in the map above (modified from Sagredo 2007), passengers and goods headed for Mexico disembarked in Veracruz; those headed for South American crossed Panama by land and embarked on a second sea voyage to Lima. Buenos Aires is one such locale. It’s hard to envision this cosmopolitan city as a backwater, but during the age of piracy, the only sanctioned way to get to Argentina was across the Andes from Lima. This relative isolation was a major factor in the development of the country’s distinctive speech patterns. This entry was posted in Latin American Spanish and tagged Argentina, dialects, Latin America, Spanish on 16 March, 2013 by jhochberg.